Before I got the set, my expectations on the set were not that high – the set as it was proposed appeared to be a small set with only one lightcycle. 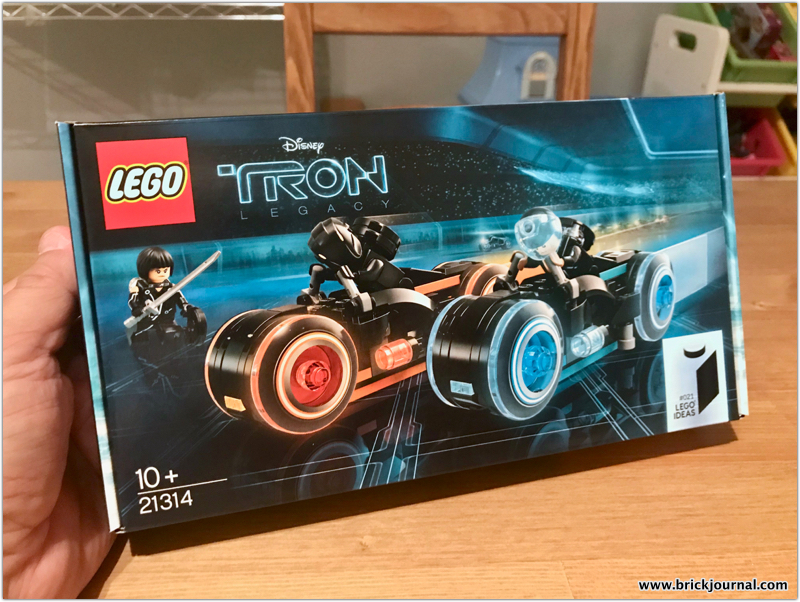 It was a pleasant surprise to see that there were two with different colors – trans light blue for Flynn and trans-neon orange for RInzler. The characters selected were good choices: Flynn, Quorra and Rinzler. Three figures, two vehcles, and a base – this looks good. Opening the box, there are two bags and the instruction booklet. There are no stickers in this set. The printed graphics are the work of LEGO Graphic Designer Mark Tranter, and his work will be touched on later in this review. The booklet is a quick read with the designers and the movie itself, which was released some time ago. The bags are separated to base and figures, and lightcycles. The build itself is pretty straightforward, with only a couple of places where things get complicated. The base is an easy build, using plates and tiles to evoke the Grid, where all of these characters and vehicles resided.It’s kinda odd the base doesn’t have a grid of its own, but this is not so noticeable when the completed lightcycles are mounted. The minifigures are the highlight of the set, mainly because the detail of their printing is outstanding. The graphics are on the torso, back, arms, waist and leg fronts. The identity disks, which are 2×2 ‘donut’ tiles are also printed. It would have been neat to have these colors be either fluorescent or glow-in-the-dark. Rinzler has his two disks and can mount them on his back, thanks to a bracket with a pin. The other figs have plate brackets to mount their disk. This is a fine note of paying attention to details, and it’s appreciated. However, there is a goofy thing – well, two. In TRON: Legacy, Quorra uses two batons to fight – so in this set she gets…two katana blades? Two shortened tubes or light saber blades would have been beter solutions for Quorra to use. After the minifigures and base are quickly built, it’s off to build the lightcycles. They are built the same, so you can build both of them together. The good news about this is that the build is pretty straightforward and except for the outer disks, use relatively common parts. The main challenge was that the lightcycle is a very curvy vehicle, and in minifigure scale, the options are limited in keeping the curves even vaguely accurate. For the most part, the lightcycles aren’t bad models. The most glaring mistake )if you want to call it that) is that the 1 x 1 trans round bricks don’t seem right – they need a print on them, as they were turbine gears in the movie lightcycles. The accents are nicely done (and needed, as without them, the model would be all black….) and the figure fits into his position in the cycle. That’s not to say this is a perfect model – there are a couple of things that are odd. One is that the outside of the wheels are attached through the center to allow them to roll…but the lightcycle has its rotating tire inside the front housing. The rolling allows a play factor, but it’s a little distracting to me. The other thing is that the light trails made by the cycles are panels that have bars on the end. This makes it difficult to extend the lighttrail beyond the initial part. So did I like it? Yes I did. I was a fan of TRON (the first movie), while the follow up needed a little polishing at the script stage. The design of the movies were great though, so it was neat to see LEGO decide to go forward with this set. This opens up other building ideas, such as the flying packs Rinzler and his group used, as well as Quorra’s car. Final verdict: The set is a little expensive for the price point, but the minifigures make the set – except for the katanas?!? !